Tour the Universe through our BIG telescopes! Everybody wishes you to have a "Nice Day" but we want you to have a "Bryce Night?" -- the best possible nights for stargazing. If your travel dates are flexible, check our list for the Bryce-ist of nights. Then come back to this page to book your telescope tour. Within the ranks of the Dark Rangers there is enough knowledge to give you an entertaining show on almost any astronomy subject. When booking your tour below, you'll be invited to pick your show preference by title. Review our Telescope Tour options and then make a reservation now! If not specified otherwise, each type of Telescope Tour follows the standard Scroll down for ALL TICKET PRICES and our cancellation policy explained near the bottom of this page. That way we will know how many telescopes to setup. These 2.5-hour public Summer Telescope Tours are offered nightly at the Dark Ranger Observatory (adjacent to, but NOT within Bryce Canyon). 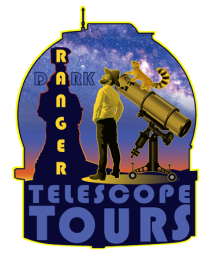 If you would prefer to have 1-2 Dark Rangers all to yourself, and that night is not already booked for a public tour, you could reserve a private telescope tour on a Sunday, Tuesday, Thursday, or Saturday night. Summer sky is dominated by the beauty of the Milky Way - a small portion of just one of our galaxies great arms. The Bryce Canyon region is one of the few places left on Earth so devoid of light pollution that you can see it in its full glory, extending from horizon to horizon. Thanks to our BIG telescopes we can show a variety of of other distant galaxies, some clustered together, some even colliding, each containing 100s of billion of stars. DRESS WARMLY, so you don't get tired or bored early! Need a Sunday, Tuesday, or Thursday, winter night? Those nights can be booked ﻿as private telescope tours. Note: A 4-person minimum must be met each night. If you book 2 people you will not be charged until the minimum is met. If by 6pm the night of your tour, nobody else has booked 2 more tickets , the tour will be cancelled and you will not have been charged. If you book two extra tickets (for imaginary people) now to avoid cancellation, AND later on, somebody else books 2 or more tickets, your two imaginary tickets will be refunded to you after the tour takes place. Cold and dry winter air makes for the absolute best stargazing! You will see deep space objects with the kind of clarity that only research astronomers with huge telescope are used to. While cold is great for telescopes it's challenging for humans. Our winter nighttime temperatures can be 10 to -10F (-12 to -24C). While our little auditorium is heated and doubles as a warming hut where we also offer FREE hot drinks, you'll still need to DRESS VERY WARMLY! Back to the telescopes for deep space objects (nebulae, star clusters, galaxies, etc.) up to 45 minutes or until you are cold, tired, or board. Start times vary so that we can begin the tour with exciting telescope views of the Moon rise. Our hikes are conducted on 3 different routes of varying difficulty ranging from 1.5 (2.5 km) to 3.5 miles (5.5 km) in round-trip length -- the first to book a given night will be contacted and invited to pick the route. All hikes fully immerse you in the nocturnal realm. Indeed, flashlights & headlamps are NOT USED! Instead you will trust in the guidance of your fearless Dark Ranger and your innate, if untested, ability to safely explore the night. And of course, you'll also get to use our BIG telescopes -- before and after the hike. 94% refund (6% retained for credit card transaction fees) if guest(s) cancels more than 42 hrs in advance. 58% is refunded if cancellation is made between 42 and 4 hrs prior to start time. Rescheduling is always an option, but no same-night refunds.